For long, passwords have been used as the primary authentication measure for accessing personal data. But these days, using just a password might not be enough to protect them against potential intruder attacks. One of the ways to secure your accounts is to use a complex password, so that they are difficult to guess. You might also want to keep distinct passwords for different accounts. Both of these measures certainly boost up security. But there’s one problem: we humans are prone to be forgetful. It’s quite difficult to create and memorize complex passwords. And with all the different online services available today, keeping track of distinct passwords could make your brain go haywire. Writing down account passwords is certainly not a solution. That’s why many users opt for password managers. But password managers alone are not always secure enough. There’s another popular method for securing your accounts, known as the two-factor authentication. This method adds an extra authentication layer by introducing the concept of OTP. But then again, manually typing a passkey sent to an external device can be hectic. Moreover, two factor authentication is usually limited to online accounts. Fortunately, there are some solutions that can offer secured access to your computer and online accounts without compromising on usability. There is a way where you can just plug in a USB device to access your accounts. Such devices, known as USB keys, may be one of the most prominent ways that replace the need for typing passwords. Below is a list of the most popular and arguably the finest USB key solutions that help you to securely log in to various online accounts and even unlock your computer. YubiKey is a very simple looking thumbdrive-esque device that allows you to access your accounts with the touch of a button. While using two factor authentication on any website, you can use this device along with your credentials to gain access to your account. Two factor authentication is indeed a strong security feature, but many users often get annoyed with it for the need of entering two separate passkeys to access an account. Now, you may safely store your account passwords in your web browser, after turning on two factor authentication. That way, your browser will automatically place your user credentials, but an intruder wouldn’t be able to access your account without the YubiKey device. If any online service does not support two factor authentication, YubiKey has you covered on that front too. It can set up two factor authentication for third party password managers (like LastPass). It can also be used to unlock your Mac, Linux or Windows computer. You can get more information on how YubiKey works on their official website. Get your own YubiKey device. USB keys are good, but you might easily lose them. Why go for a USB key when the best authentication device is always with you. For years, fingerprints have been used to authenticate users in several fields of work. Now you can use it to gain access to your computer, and even your different online accounts. iTouch ID is a small USB device that you can attach to your Mac or PC and leave it there forever as an integral part of your computer. It can unlock your system and help you login to any of your online accounts by keeping your finger tip on top of the device for less than a second. The 500 PPI resolution capacitive sensor on the iTouch ID allows it to capture the finer details of your fingerprints for better accuracy. Under the hood, it stores your fingerprint data and all your credentials securely encrypted within the device, locked away from external access. iTouch ID currently supports Macs and Windows PCs. It is also working on extending the support for Android and Windows based tablets as well. While YubiKey provides its own proprietary USB device, Rohos lets you convert a regular USB drive into a security token for system authentication (Mac and Windows). 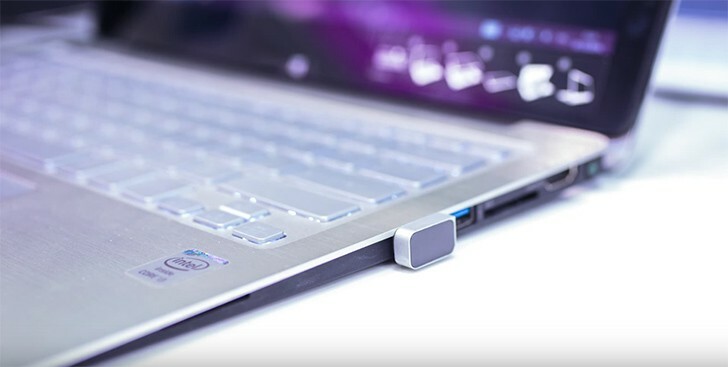 Rohos Logon Key allows users to login to their computers without typing passwords, just by plugging a USB drive. It supports Two-factor authentication, and the software allows you to choose from multiple 3rd party solutions (such as Google Authenticator, USB Key, etc.) to use as the authentication device. It works with multiple computers, so you can use the same USB key to login to your office computer, personal desktop and your laptop. Rohos also provides a feature called Emergency Logon, which allows you to recover the two-factor PIN in case you lose your secondary authentication device. With this, you can log into your computer by answering some pre-defined questions; following which, you can reset the two factor PIN and gain access to the system. You can learn more about Rohos, on their official website. Predator is a USB key based system locker that protects your computer from any sort of unauthorized usage. Once you have converted a USB drive into a Predator Drive, it acts as the virtual key to gain access to your computer. As long as the Predator Drive is plugged in, you can use the computer normally. But when it is plugged out, the software automatically locks your system, turns off the display and disables mouse and keyboard inputs until the key is plugged in again. A built in scheduler helps you define specific times of day that the computer could be accessed without the Predator Drive. This is a useful feature to give your family and friends limited access to your computer. The scheduler is flexible and allows you to define different access schedules for different users for different days. Like Rohos, a single Predator Drive can be used to unlock several computers. It is only compatible with Windows PCs. You can learn more about Predator and its features on their official website. USB Keys are only one of the many ways that allow you to access your accounts without typing a password. We’ll talk about some more of these solutions in our upcoming articles.